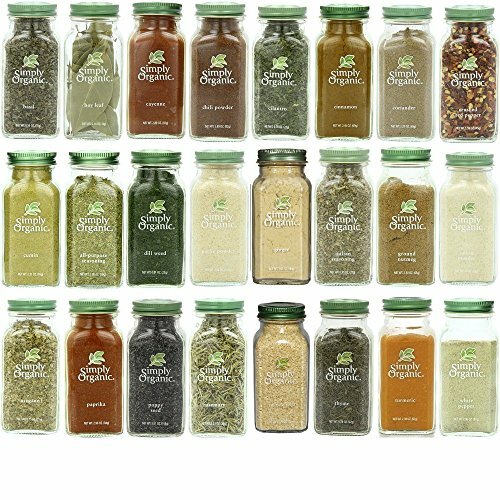 The Simply Organic Gourmet Top 24 Spice Set includes the top organic culinary spices. And includes one bottle each of: Organic All Purpose Seasoning, Organic Basil, Organic Bay Leaves, Organic Cayenne Pepper, Organic Chili Powder, Organic Cilantro, Organic Cinnamon, Organic Corinader, Organic Crushed Red Pepper, Organic Cumin, Organic Dill Weed, Organic Garlic Powder, Organic Ginger, Organic Italian Seasoning, Organic Nutmeg, Organic Onion Powder, Organic Oregano, Organic Paprika, Organic Poppy Seed, Organic Rosemary, Organic Sesame Seed, Organic Thyme, Organic Turmeric, Organic White Pepper. Great gift for anyone, anytime, anywhere!